Muruku is a tasty South Indian snack. 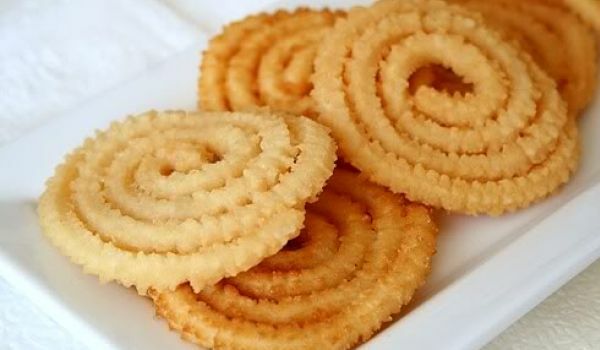 It is known as Chakli in Marathi and Chakri in Gujarati. Learn how to make/prepare Murukku by following this easy recipe. Take a bowl and put rice flour, urad flour, besan flour, cumin seeds, sesame seeds, red chili powder, sesame seeds, and salt into it. Mix them well. Soften the butter and add it into the mixture. Now add water slowly into the mixture and knead it to make soft dough. Place a lump of dough in Muruku Maker. Pipe out the patterns, forming circles, on a greased plate. Heat oil over medium flame. Carefully fry murukus in the oil, without touching each other. Fry till they turn light golden brown in color. Place the murukus on a kitchen paper towel, to drain the surplus oil. Murukku is ready to eat. Store in a dry container. muruku. I am dying to try out yr recipe. But I do not kno w what is besan flour. Is it the same as green bean flour? And urad flour, is it made from black bean and also known as black gram flour?